During winter months, roofs, gutters and down pipes can become blocked by snow and ice, resulting in excess loads on roof structures. During thaw, excess water flows to overhangs, gutters and down pipes, where it can be obstructed by existing snow or ice and/or refreeze. As a result, standing water often infiltrates roofing, causing costly damage to the building structure. 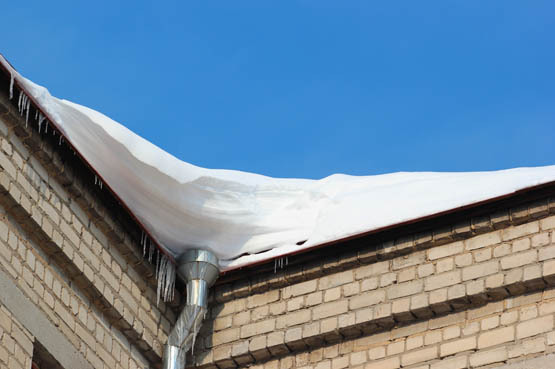 The formation of icicles from blocked gutters can be a hazard to all personnel walking beneath, coupled with insurance claims for water damage and delays during repairs, experiencing blocked roofs and gutters can be very costly. Electrical trace heating cables can be run onto exposed roof valleys, gutters and within down pipes to alleviate this problem, insuring free and proper flow of any excess water. Design of the system, takes into consideration the power output of heating cables in iced water and ensuring all components are certified to be used under extreme cold conditions and yet cable of withstanding high ambient temperature exposure during summer months when not in use. Depending on the size and type of system, controls employed can vary from simple ambient sensing to more complex ambient and moisture sensing, thus insuring that the correct amount of energy is deployed at the right time.